Dyna-Ski Boats: So you are thinking about a used inboard instead of a Dyna-Ski? So you are thinking about a used inboard instead of a Dyna-Ski? I took this picture at a gas station a couple summers ago. With gas holding in the $3.00 to $4.00 per gallon level the past couple of summers it reminds me of how much gas my old outboards used to use. Much has been written about the increased fuel and oil efficiency of outboards so I'll let you do your own research for now. I can tell you that I buy a lot less gasoline and oil now than I ever did. 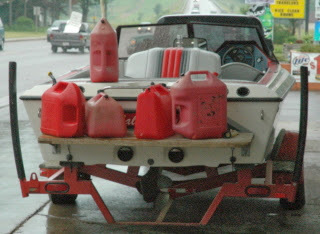 This picture should serve as an eye opener if you are wondering about how much gas one of these older inboards might use.